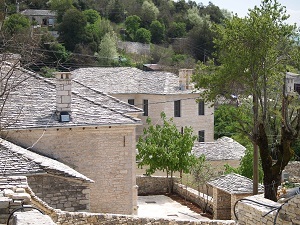 Ano Pedina (High Meadows, also High Soudena) is a village in the region of Zagori. 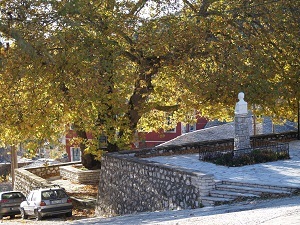 It is located 35 kilometers north-northwest of Ioannina at an altitude of 930-1030 meters above sea level. The first historical mention the village is in a bull of Simeon Palaiologos bishop of Epirus at 1361.Until the 18th century the main occupation of the inhabitants was the small-scale farming. Since that time, the men of the village began traveling in search of work, first to the north and central Balkans and in the early 20th century mainly to Egypt. The cultivation of the land was the main work of women. Soudena was considered as a fertile village. Cereals, legumes and vineyards were mainly cultivated in the region. In 1928 the village was renamed in Ano Kampos and in 1929 in Ano Pedina. Despite the demographic reduction that mountain villages of Epirus faced during the war, Ano Pedina doesn’t show the picture of total devastation which unfortunately is observed in many other villages. To date, the village counts around 80 permenent residents, who are mainly engaged with farming and tourism.